Combine olive oil, shallots, onion and red pepper flakes in a large soup pot. Let them caramelize a bit and then stir the vegetable stock in it and bring it to boil. Now, add lentils and rice to the mixture and simmer for more than 30 minutes. By that time, lentils should have mixed into the stock, add salt into it. 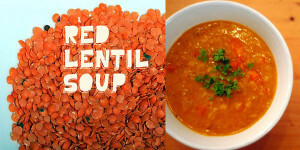 Serve this red lentil soup topped with feta and drizzle almond oil.